A lighthearted comedy; a disturbing tale of race, gender and violence; and a Jane Austen classic will be the stories revolving through this summer’s Island Shakespeare Festival from July 13 to Sept. 2. In its ninth season offering “pay-what-you-will” performances on an outdoor stage, this year’s productions are “Twelfth Night” and “Othello,” two plays written by William Shakespeare, and “Sense and Sensibility,” a novel written by Jane Austen. Twenty professional actors hired from across the country are halfway through rehearsals learning their lines, characters and blocking for two plays — or more. “Ask any actor right now and they’ll say it’s exhausting,” said Artistic Director Olena Hodges, who selects the plays and hires directors. She’s also an actor with experience juggling roles and plays from one day to the next. “You’re in a beautiful place and spending the summer doing what you love, but you’re also working nine hours a day out in the sun,” she said. Rehearsing two different plays a day means “changing your brain” a lot, not only for dialogue but also for directors’ differing styles. Two actors who grew up on Whidbey, Andy Walker and Cameron Gray, are part of the cast. The festival always includes two Shakespeare plays and one by another playwright. Plays are performed in an outdoor amphitheater in Langley. Hodges chose a Jane Austen story, she said, because the ISF production of “Jane Eyre” in 2016 was a big hit. Charlie McGrath directs “Sense and Sensibility,” which was adapted from the novel by Kate Hamill. It follows the lives of three sisters and their mother as they are forced out of their home by a wicked half-brother. Gossip, family bonds, romance and wealth are explored with lighthearted fare among the stuffy British bourgeoisie. “Twelfth Night,” directed by Kristin Clippard, is a farce Hodges viewed as needed by many. Considered Shakespeare’s comedic masterpiece, it’s an unusual love triangle set in motion by a shipwreck. The play “Othello,” directed by Terri McMahon, however, is bound to spark polar opposite emotions. A tragedy of love, rumor, envy and manipulation, the local production switches up some gender roles and racial relationships. “It’s about race and violence and how we treat each other,” Hodges said. She cautioned that “Othello” is not suitable for children under the age of 10. Although all three directors are women, it wasn’t intentional, Hodges said. She said she also could not have predicted the timelessness of her selected plays. From humble beginnings in 2010, Whidbey’s Shakespeare repertory theater has grown in reputation and regional pull. 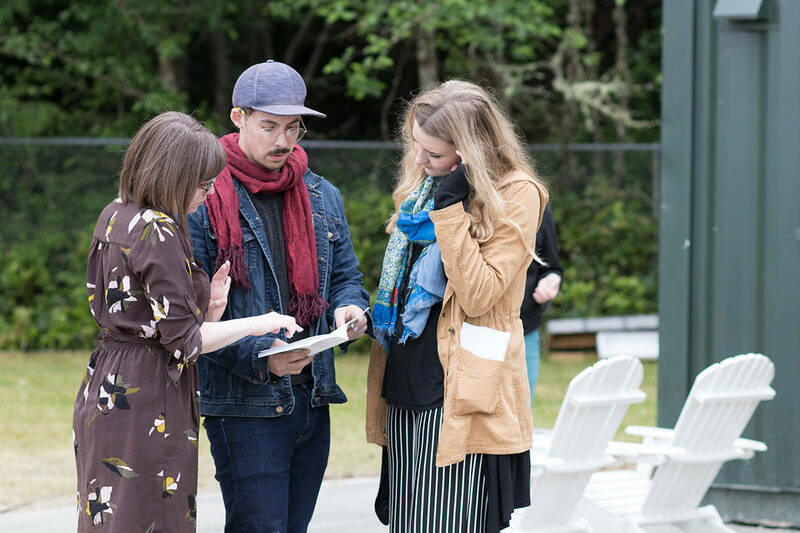 It began when Susannah Rose Woods, then a Whidbey Island newbie, wanted to put on a Shakespeare in the Park kind of play. Peggy Juve helped develop the concept into a pay-what-you-will festival as both women wanted Shakespeare to be affordable to all. Many community members contribute as volunteers, making costumes and helping with design, lighting, production and other needs. The nonprofit organization depends primarily on donations from businesses and individuals for its $250,000 budget.